Sign up for our free newsletter and receive FREE home management printables as a thank you! Halloween is just around the corner and today we wanted to showcase a fun and easy craft you could do with your kids. 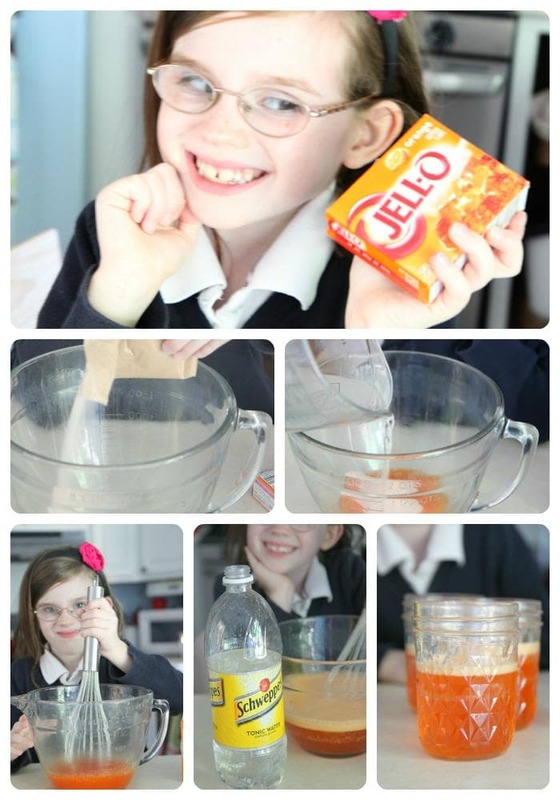 Today’s recipe offering is how to make glow in the dark JELL-O in jars for a spooktacular Halloween dessert. 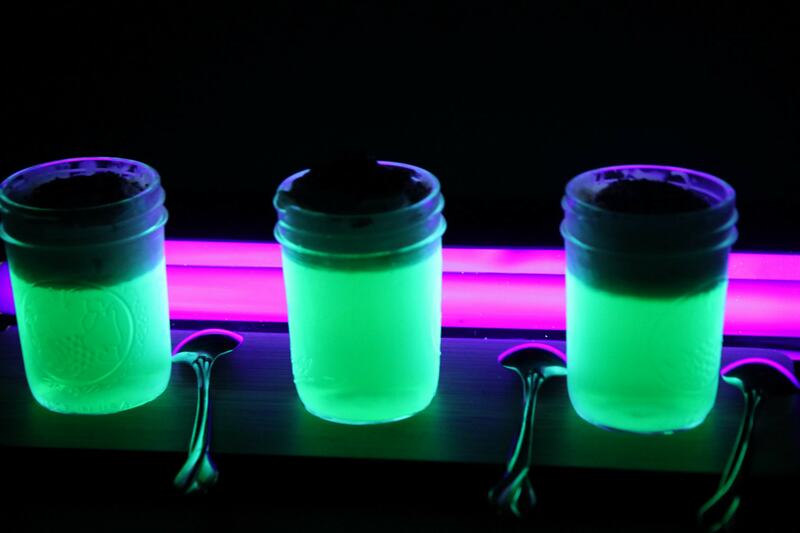 Glow in the Dark JELL-O is a recipe that your kids can easily mix up and gives you a fun opportunity to talk a little bit about the science behind it in the process. Did you know that tonic water can glow under a black light? 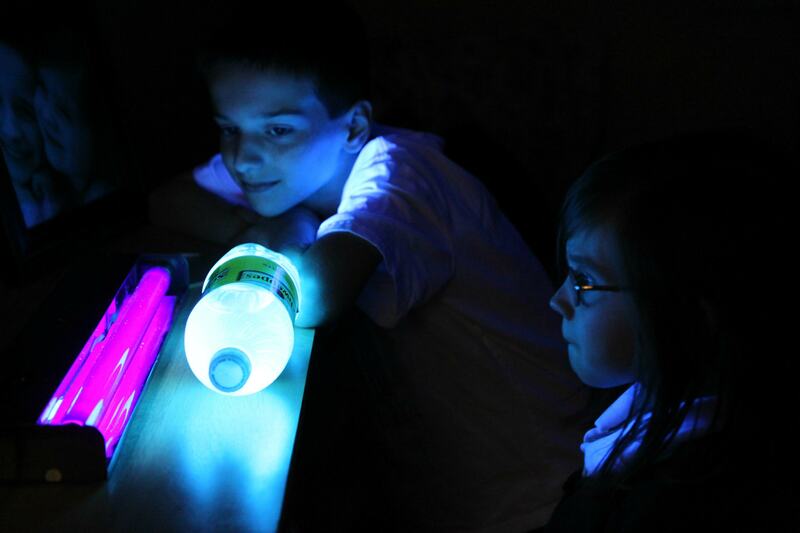 My kids were in awe of this bubbly drink and how it could glow under the black light. 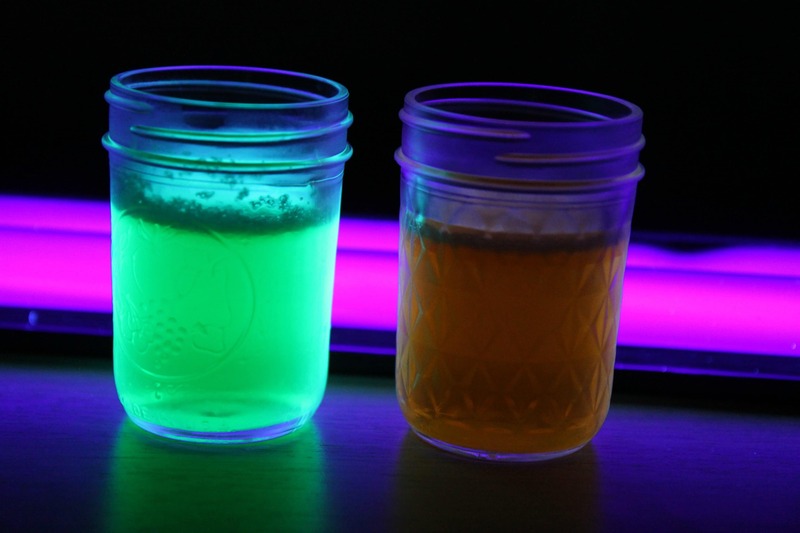 The glowing comes from the fluorescence of the quinine in the tonic water. Quinine also gives tonic water a distinctive bitter flavor which is why it is best mixed with other sweeter ingredients. As you can see, the quinine glows blue-white when placed under a black light which makes it the perfect ingredient for a spooky JELL-O treat. Do All Colors of JELL-O Glow the Same? All of the colors of JELL-O will definitely not glow the same. We tested two colors (green and orange) and found brilliant results with the green JELL-O and dull results with the orange JELL-O. Although our tutorial below shows the orange, we recommend the green variety for a truly great glow! 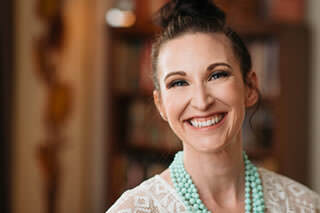 Here is the light we used to achieve our glow with great success (affiliate link). Other readers have stated that a black bulb does not achieve the glowing results so please keep that in mind when purchasing your bulb. So It Glows…How Does it Taste? As we mentioned before, the quinine in the tonic water makes the tonic water glow, but it also yields a bitter taste. We tried to cut the bitterness by using half water and half tonic water. 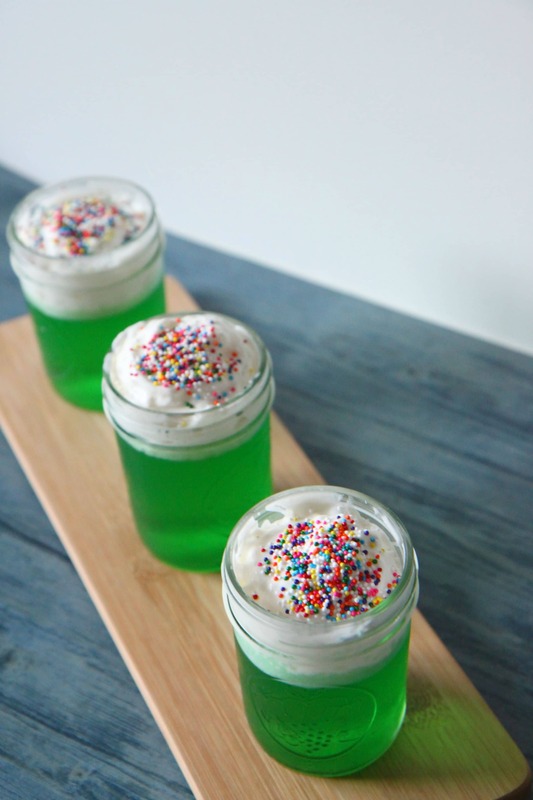 I also topped each jar of JELL-O with whipped cream and sprinkles which would add another layer of sweetness. Try adding more sugar to the concoction to help cut some of the bitterness. The kids loved the glow, but said they were, “spicy,” which is what they say about all sodas and bubbly drinks. If your kids have a sensitive palate like mine, they might not love them, but they still ate the whipped cream and loved doing the experiment. I still call this experiment a win for creativity, cool science factoids, and fun. I had a great helper in the kitchen for this project. 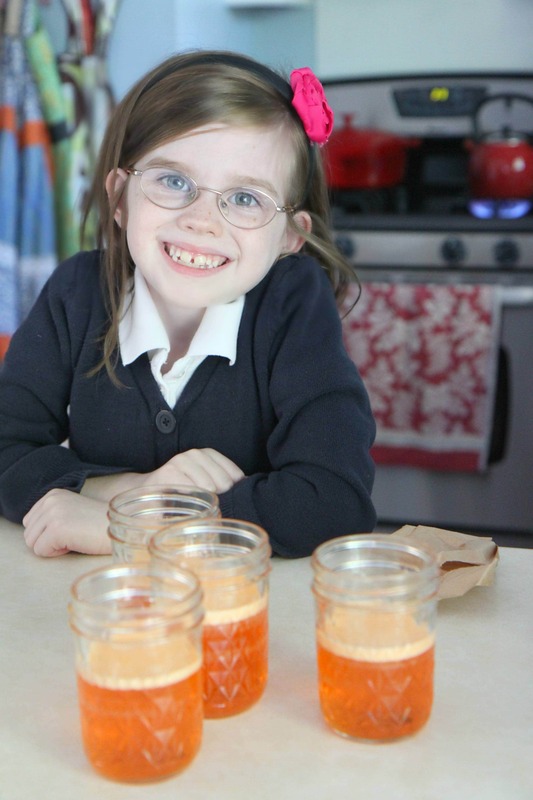 Emily was excited to show you all just how easy it is to make this JELL-O and you can find the recipe below along with her picture tutorial on how to recreate this fun experiment in your kitchen. You can totally steal the experiment, but I am keeping my sous chef for myself! 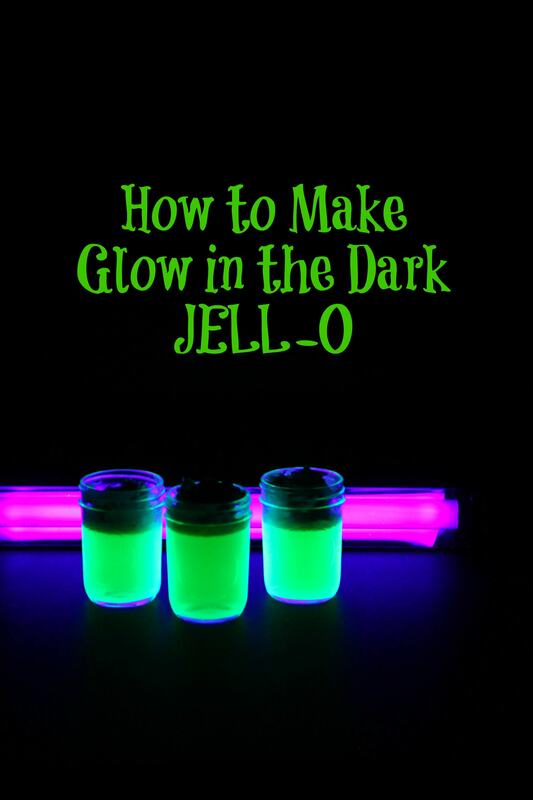 Glow in the dark JELL-O is not only a fun science project, but a super fun Halloween treat. Pick up a black light at your local Halloween shop to show off it's glow! Pour JELL-O packet into a large bowl. Have a grown-up help you add your boiling water. Have a grown-up pour one cup of tonic water into a measuring cup. Slowly whisk while adding the tonic water. The mixture will be very bubbly. Give it a couple of minutes to rest. Pour it into four clean jars. Place under a black light and watch it glow. Happy Halloween! EDITORS NOTE: See notes above for taste and ideas for improving flavor. Love this idea for Halloween? Can I make a few other fun fall recommendations?